Andrew Upshaw still leads at the Cherokee Lake FLW Tour, but the margin is now less than 2 pounds. Andrew Upshaw took a bit of a risk today, and it might’ve bit him. 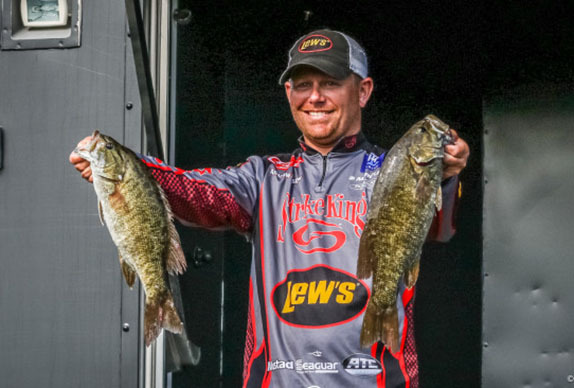 Playing with a decent-sized lead in what has been a tight FLW Tour event on Lake Cherokee, Upshaw decided to begin day 3 on what he considered a “gutsy” starting area. The result was an hour of lost fish and non-keepers that snowballed through the rest of the day and cost him a good chunk of his lead. “That was probably the most stressful 16 pounds I’ve caught,” said Upshaw, whose 16-00 bag still kept him in the lead, but only by a little less than 2 pounds over a hard-charging Tom Monsoor. Monsoor caught 17-06 today to jump from 8th to 2nd, while Dylan Hayes slipped to 3rd despite weighing in a pair of kickers, but he a lost a third one that cost him a chance at taking the lead. Grae Buck stood pat in 4th as he, like Hayes, couldn’t eclipse the 16-pound mark today. Andy Young continues to steadily be in the hunt, cracking 16-13 to move into 5th. The big bag of the day came from Matt Becker, who caught 17-11 to jump from 19th to 6th. And rounding out the top 10 is Tim Frederick, Jason Reyes, Derrick Snavely and Tim Cales. After two days when everything went right for Upshaw, he might’ve been due for a harder day. That’s exactly what happened, as he says he couldn’t get anything going to start. While he laments not being able to once again extend his lead, he knows he still has plenty of areas of marked bedding smallmouth he’s yet to touch. Plus, he has an ace-in-the-hole he found while “practicing” on day 2 that he plans to start on tomorrow. It’s not a spot that has a lot of fish, but Upshaw says it has the right ones, and he’s hoping it works out better than his risky move from today. Speaking of easy, Monsoor certainly made things look that way today. Tossing around a swimjig, per his usual, he sacked up a quick limit before 8 a.m., yet somehow managed to stay under the radar despite the live coverage. It was quite the shock when he brought in his big bag to jump up the leaderboard. As for Hayes, he mentioned he needed to keep getting a couple big largemouth bites a day to keep up with the smallmouth guys back in the main lake. Well, he got three today. Problem is, he only landed two. For three days, Hayes has been making a long run upriver to target largemouths by flipping a jig and sporadically mixing in a spinnerbait. There’s been one key point with a channel swing that’s accounted for the majority of his weight. The odd part is, he doesn’t know which side of the point they’ll bite on each day. On day 2, he caught three good ones off the left side. Today, he never got a bite there. Instead, he caught two off the right, including a 4-14. He got two of his big bites today in completely new water, though, including one in a flurry when he caught three fish in five flips. Toward the end of the day Hayes decided to try and upgrade with some smallmouth, which he never did. Don’t expect the same tomorrow, though. > Day 3 stats – 30 anglers, 30 limits.